2 by 3 Heroes: That's STILL no moon! Let us return the the DVD player box that was anything but a DVD player. So yesterday I talked about the 7th Inning Stretch blaster that was much like a stretch if you were placed on a rack. Maybe not that bad, but is was something you would expect from a repack box of that sort - a big snooze. Today, we are going to talk a bit about the cards that, through my sorting, won a place in my heart and have escaped what could only be termed the trade box, cuz really, that's where the stuff that doesn't rock my world ends up. I found a fair number of White Sox cards, which I may or may not have. That's for sorting on another day. Also found a few Blackhawks which I am sure I don't have because who the hell can really find hockey cards in a retail store. And then I found cards that just made me feel good. 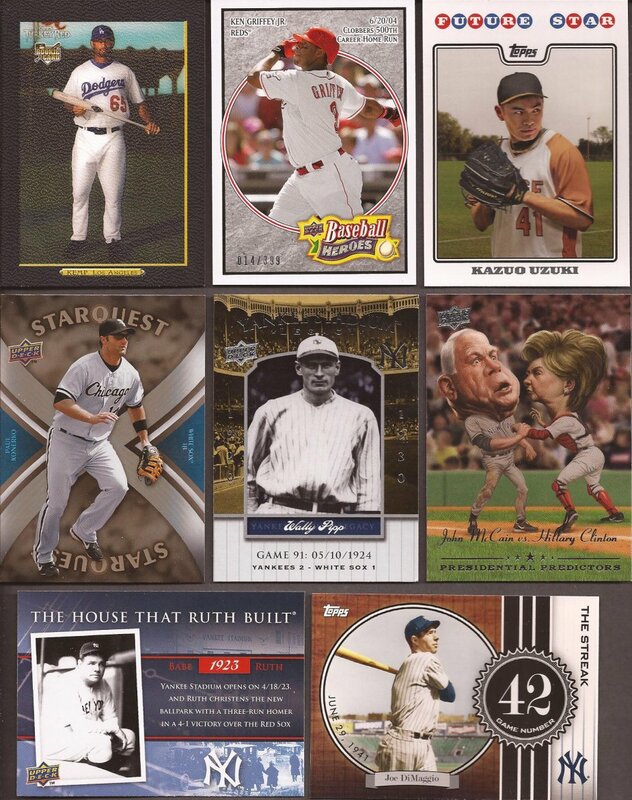 Rookies, inserts, short prints and the like. I have a nice stack (about a hundred), but time & space stop me from scanning them all. Plus, you may already have fallen asleep just reading this now, and a sleeper reader retains no knowledge. And you will wake up next to this guy. So here's just a small sampling of what I picked out all special like. Boy, those Turkey red cards scan like crap. But it is a black bordered Kemp rookie. Center is a Baseball Hero Griffey 14/399. Nice low number. Remember the Future Star joke from 2009 Topps. I knew I had one, and there he was. Row two starts with a Ultra Rare Starquest Konerko. I scratched and redeemed the code - damned if I remember what you got for it. I think something stupid in ToppsTown. Found 11 of the Yankee Stadium Legacy cards. That is the lowest game I own. The far right in row two is an alternate card from the 2008 Presidential Predictors. It's card 11b. I also happen to have card 11, and it's the exact same picture, but Obama in place of Hillary. On the bottom, you have the House That Ruth Built insert from 2008 UD. Luckily (to me) this is card #1 of the set. Not a lot of book value, but I don't mind. And the final card is one of two cards I have from 2007 Topps. Simple and nice. Now I just need to get the "Streak before the streak" to match up. Alright - that's two days. Tomorrow, we'll dive into the Allen and Ginter. Whoa baby....is it good! If at all possible, I would love to trade for the Kemp.